Patrick Kane continued his hot streak with a magnificent third period and Antti Raanta earned his first NHL victory as the Blackhawks stole a 3-2 victory from the Calgary Flames. Kane scored twice, exactly ten minutes apart (at 9:42 and 19:42), to extend his personal point streak to 12 games. The game-winner came after the Flames iced the puck with just over 20 seconds remaining in regulation. A mediocre effort on the Flames’ second goal led to Brandon Pirri being firmly planted in coach Joel Quenneville’s doghouse; he didn’t take a shift after that second goal. Pirri didn’t return to the ice after the goal, but neither did the Flames’ offense. The Blackhawks allowed only one more shot on net in the final 17:55 of the game. Suffocating defense in front of the net afforded the Hawks plenty of opportunities to transition up the ice. Now, they just needed to get a puck past Reto Berra. The Hawks struggled to complete passes and missed on a number of great scoring chances, either whiffing on shots or missing the net. Meanwhile, Berra played phenomenal hockey for 50 minutes. 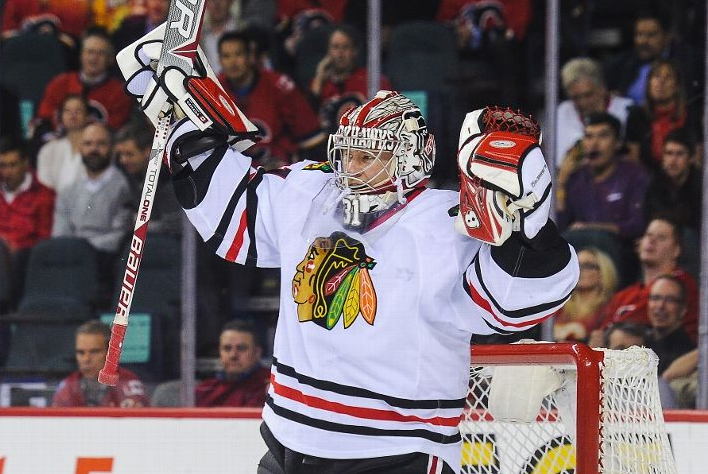 He made a number of key stops on the rare occasions that the Hawks put the puck on net. Between Berra’s strong play and the Blackhawks struggles to get a clean shot on net, they needed a great performance between the pipes from their own netminder to stay close. Before Kane got the Hawks on the board, Raanta played exceptionally well and kept his teammates in the game. He wasn’t tested much in the first ten minutes of the game, but made a handful of big saves late in the first and in the second period. He stopped 20 of 22 shots to earn his first NHL victory, and showed his emotions as the final horn sounded. The Hawks kept the pressure on, and it finally paid off in the middle of the third. Kane’s first goal was followed by Patrick Sharp’s ninth only 56 seconds later, and the Blackhawks made another two-goal deficit disappear with incredible speed. With 18 seconds on the clock, Kane deposited his second goal of the night. Niklas Hjalmarsson was credited with two assists and a team-leading two blocked shots in the game. Also on the blue line, Brent Seabrook led the way with four hits and played a strong, physical game. Michal Rozsival also had a couple big hits in the game. Marian Hossa, Duncan Keith and Brandon Saad were also credited with assists in the game. Kris Versteeg didn’t register a point in the game, but played one of his best games since returning to the Blackhawks. For most of the game it looked like Reto Berra was going stone than again. Both teams had whiffed shots that should have been goals and then Calgary cashed one in and I thought oh oh, here we go again. Calgary is just one of those teams that won’t get outworked so if the energy level is a little low or the focus is a little off, they could steal one from ya and that’s what looked like was going to happen. But then Kaner donned his cape and flew in to take over the game. We’ve seen that spin around backhander before but it sure looked good going past Berra’s shoulder and hitting the back of the net. Game. Set. Match. See ya next time. I agree about Versteeg – looked to be more dangerous this game. Hopefully that’s a preview of coming attractions. Oh yeah – sure is nice to have Hossa back. Calgary plays like Columbus did last yr.
Calgary deserves credit for smothering the Hawks attack through 2 periods and Berra was good. Calgary plays hard and has a decent forecheck. The Hawks had trouble generating many chances between the rings and that is where most goals get scored. Of course it finally broke lose again for the Hawks in the 3rd as we have too many weapons to be kept down over the course of 60 minutes. I think opposing teams get worn out trying to shut down neutral zone possession. Then the dam breaks. Raanta did his job last night and looked to be in control. That is what we need from our backup netminder. At the final whistle Antii was mobbed by proud teammates that clearly were pleased with his performance. Nice job kid!! Well noted by Tab was the Pirri sit in the doghouse following a giveaway that resulted in a Flames goal. The kid remains on a short leash as do the other youngsters. Good observation from ebonyraptor concerning 23. Steeger had some extra jump last night, and if this becomes the norm he will start producing. He had one of our few good scoring chance last night between the rings and is getting to the right spots on the ice to do some damage. He clearly looked faster though in my eyes. Seems the best way to defend Kane is to deny him the puck. Good luck with that. Once he gets puck control he causes opposing teams lots of problems as he opens the ice up for teammates to fill in. He is a confident mature player and rightfully earning some big accolades. His hands are scary fast and his vision is outstanding. Another great game from Kaner. Never mind he and Toews are not even in their prime years yet. Yikes…..
Great start to the circus trip. Team d pretty good and the Hawks are finding a way especially in the 3rd to take it to the next level. Skating 4 good lines eventually breaks opposing teams down hence positive results in the last 20 minutes. The train is starting to roll. Have a great Thanksgiving everyone. As Hawks fans we have much to be thankful for! Can anyone back me up… 37 did take at least 2 shifts after the 2nd goal!!! or do I have to watch 3rd period again. When I saw the lines for last night’s game with Handzus centering Saad and Kane, I couldn’t believe it. Sharp-Toews-Hossa have been on fire, Saad-Pirri-Kane with Kane on an 11 game point scoring streak, Bollig-Kruger-Smith anchoring the 4th line, the forward opening was on the 3rd line with Bickell out. Shaw-Handzus-Versteeg should have been the line to start the game but Q sees differently and again mixes up 2 lines, messes with the success we’ve been having and causes his own problems with Pirri. I totally respect Q for his leadership, in game coaching and ability to get the most out of his players but he creates his own unnecessary issues with these line changes. What more does Pirri have to do as Kane’s center with Kane being on an 11 game streak and an improving his plus/minus while doing so? Let’s drop Pirri to the 3rd line out of his comfort zone and then when he makes a mistake, bench him. Unbelievable. The Hawks should have won the game easily last night but couldn’t bury a chance in the first 2 periods. They played their tails off in the 3rd to get those 2 points. Moving forward, this team has a great chance to repeat barring injury or fatigue. Let’s go Hawks! So, is THAT how a goalie’s glove is used? Wall- I think you are right on Pirri taking at least another shift or two after the penalty. Anyone else shocked that Kane had his best chances away from Handzus? Anyone? Sharp was definitely drunk. He missed half a dozen open nets. Maybe he started celebrating early? It’s also easy to say that the Hawks should have never signed Khabi and Raanta should have been given the backup job since day 1, but Khabi was actually really good last year and no one knew how well Raanta would play on American ice. It was still only one start and even Khabi looked good after one start. Amazing how long it took Q to get Kane away from Handzus. Now does Pirri get the 2C back or does Q continue to hold the team back with Handzus as the 2C? Kruger and his line never took a draw in the offensive zone. Which is weird since the Hawks were in the offensive zone the entire night. Kruger was the only person with a FO% >50. Amazing how much better he’s gotten in the circle. Can we stop calling Bollig a heavy weight now? When is the last time he won a fight? That was a stupid fight. Excellent game where talent and smothering defense eventually prevailed. Give the Flames credit…they are tough as nails and no quit as they start the rebuild. Easy for me to root for that franchise. They may have found themselves the heir to Kipursoff in goal too. Keith and Hjalmarsson were superlative in the 3rd period. Hammer is insanely underrated. Any other team and he is in the Norris conversation. Strong games by Kane, Saad, Sharp, Hossa, Leddy and Oduya. Versteeg not so much. Pirri? Been a lousy road trip for him and his weakness on defense and slowness on skates is increasingly showing. After that very stupid play that let to his benching? Well, let’s just say he was seen buying a water bowl upon arrival in Dallas this morning. JS- agree on 52… the guy is not a good fighter. Average player- (but fits the Cap well)-way better options down the road. 26 on 2nd and 37 on 3rd… both are bad lines… Q- who you crappin? And JS- I was the biggest moaner on the Khabby sign… you brought me down to earth w/ the “experience vs. unproven”… but to SB’s credit- I have read that when they waive/cut ties w/ 39… the 39/Raanta thing will be Cap neutral? 26 is an “insurance policy”. At this point of career- does nothing well (except reads the game well), and everything OK! I like the guy- has a place as an experienced Gap filler… comparable to a 40 year old Utility player in MLB! Rufus- Sharp had a strong game??? Not only did he miss the net… He almost missed the puck!!! And the only one he connected on – he got his stick in the way of a pass from HOF 81. Versteeg- skating improved… and made a smart/subtle Pick play (Bolland-esque) on the Game winning goal to allow the D-man to get/shoot the puck. And yes 37 was not good… but he was skating on the wrong line most of the nite! And did regress with that little “CUTE” back hand – no look pass/TO that led to Flames goal! I will agree with you there. Hammer wouldn’t be in the Norris talk no matter where he played because he doesn’t score points, and sadly, that’s all that matters these days. There probably won’t ever be a reason to take Khabi off of LTIR unless he wants to try to catch on with another team. If you ask me, the second his groin (assumed) popped, he realized it was over. I doubt we see him in the NHL again. However, you are correct on the dollars matching if Khabi gets cut and Raanta is the new #2. I actually thought the Versteeg Pirri Shaw line was pretty good last night… but it’s not like the Flames have any offensive fire power. I’m trying to remember Pirri’s turnover which led to the second goal, did Leddy put him in a bad position or did he just try to make too cute of a play? Regardless, Oduya blew his coverage on the back check. He went after the guy with the puck instead of the guy sitting in the slot (that eventually scored the goal). It just amazes me how people on this wall think the are smarter that the future hall of fame coach and the guy that brought us 2 cups in 4 years. Q ALWAYS tinkers with lines to try to find a spark. It seems to be working people…….but I’m sure JR and wall would do a much better job of it or do so now on the teams that they coach….. Overall a lacklustre effort and a fortunate win for this talented team…and while Raanta was good, Kane and Versteeg kind of willed the Hawks to win. Yea, I mentioned it awhile ago about 39/31 cap hit being the same (1.7-.925 ahl, .875 + .925 = 1.7). If we can I think its better to keep 39 on ltir (1.7- .925 = .875 more), it should give us more (.875) flexibility & deadline space. Rufus, you can’t “read” the box score and think you watched the game…Sharp, Oduya and Saad were NOT great…Saad got dumped to the 4th line for a couple of shifts…and next to Kane, Versteeg was the 2nd best player on the ice…if you watched the game how could you have missed this??? Really doesn’t make JS and me smarter than Q!!! Just me and JS stating the obvious and Q “out thinking himself”. I enjoy Rufus’s comments they are Honest and bold… he’s not always right-(like me-ha ha) but he DOES offer up some good observations and stimulates conversation. I’m really tired of the attitude of not second guessing the coach because he has won Stanley Cups and I/we have not. It’s honestly ridiculous. Q makes bad decisions. Every coach makes bad decisions. No one is saying they can do a better job coaching the team. Sadly, we have a team of beat writers in Chicago that won’t ask Q why he is doing what he does. Examples: Against Detroit in the playoffs last year. Hawks couldn’t score and it took until they were down 3-1 to unite Kane and Toews when we were bitching about it for a few games prior to that. Against Boston, Q broke up Toews and Kane again (and Bickell). We bitched about it immediately. Finally, after being down 2-1 in the series, he puts them back together and they win 3 straight. Handzus has a place on the team, but it isn’t with Kane on his wing. That’s just a waste of Kane’s talent. Well, he could still play them together, he was just trying to protect Bickell by moving him down. Arguments could be made both ways, but as Wall and I always say, Q thinks too much. He gave too much respect to Chara and not enough to his players. Remember when Toews was taking shifts with Kruger and Frolik? Woof. I also agree, for the most part, about Rufus. I just wish he backed up his observations with reasons besides “I’ve been watching hockey since the 70’s”. I’ve been a partial season ticket holder for 18 years. I also continue to play recreational hockey at the ripe old age of 50. And yes, you pompous windbag I did watch the entirety of the Calgary game with my wife, daughter and her boyfriend. So go ahead and question my hockey acumen all you want. I’m happy for you that you get to see games played in Rockford and are able to question Q based on your wondrous scouting talent from watching AHL games and tuning into Pat and Eddie. Sharp did indeed have a good game. He was all over the ice and his two way play (for him) was exceptional. Done dealing with you. Kane tied for 4th in the league in scoring. ‘Merica! Shooting % well above career average again. Really doing incredible things on the ice. At least with the roster complaints none of the defenders were over 23 mins on the ice. Haha, Sharp had a rough night in front of the net but still got a good bounce, at least he is in the right spots. He’s pretty feast or famine in the scoring goals department anyway. Not dissimilar to James Neal. He’ll get his 30 just in bunches. 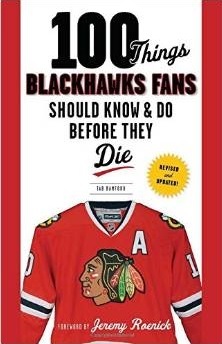 For as much as Toews is praised across Hawks nation, he does, every so often, deserve some criticism. On the play that led to Calgary’s first goal, Toews’ one handed poke at the puck is one of those time when a little criticism is deserved. It was not the maximum effort type of play we’re accustomed to seeing from the Captain, and had that been Pirri this season or Stalberg last season, there would have been a lot more words written on the internet to expose the poseur. That’s not to say Toews is supposed to be perfect, never making a bad play or having a bad shift or even a bad game. But it is to say that when he does make a bad play, especially one where it was a lack of effort on his part, it shouldn’t be glossed over like it didn’t happen. Toews is a world class two-way player, reigning Selke winner, and as Hawks’ fans we know his intangibles are probably the biggest tangible reason for the success the Hawks have had ever since Toews donned the “C”, but as such, he should be held to a higher standard. I don’t recall who made the observation that the Toews line was outplayed by the Stajan line but I agree with that comment. Maybe Toews was just having a low energy day, it happens to all humans, or maybe he’s not 100%, again – all humans, but it was one of those rare times when Toews didn’t match or exceed the intensity of the player opposite him and as with most leaders, when they don’t lead the charge – the battle usually doesn’t get won. I’m thankful the Hawks have the man in the Superman cape on the 2nd line to rescue the day when mere mortals fall a little short.